Caveat Emptor: The National’s third LP, Alligator, remains my favorite album of the past two years. Nothing has touched it. The National craft mood music. In the span of four albums and an EP they have created a niche of elegant and dark atmospheric rock bolstered by vocalists Matt Berninger’s languid baritone and everyman poetics. These are the 21st century blues for those who grew up in the ‘80s. A world view framed by three decades worth of anxiety, mild paranoia, and disappointment. A vision fully, and flawlessly, realized on the group’s third and previous album Alligator. Now, two years later, The National returns with Boxer, a slow burner and natural follow up to Alligator, that riffs and expands on the same themes and motifs while avoiding repetition. For the most part, minus a track or two, Boxer moves at a steady pace creating an “album experience” best taken as a whole. And that whole is one of the best albums released thus far in 2007 — It’s available today via the Beggars label. 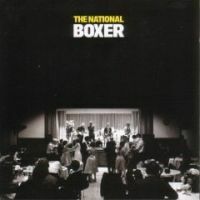 + Download The National through eMusic’s 25 Free MP3 offer. + Visit The Hype Machine for additional National MP3s. Agree wholeheartedly. The best American band working today, in my opinion. Dangerous without being cliched. Elegant without being weak. Dark without being depressing. Fun while still being smart. Hahaha I thought it said “showered and blue blazed”…I was like yeah, light one up! But anyways, I loved the video…thanks! “one of the best albums released thus far in 2007.” Agreed. I wrote almost the exact same sentence in my review of the album over at my blog. I’m loving it, a ton. I think i’m with the majority…love Boxer, but still prefer Alligator by just a bit. Great band, they make us Cincinnati folks proud.